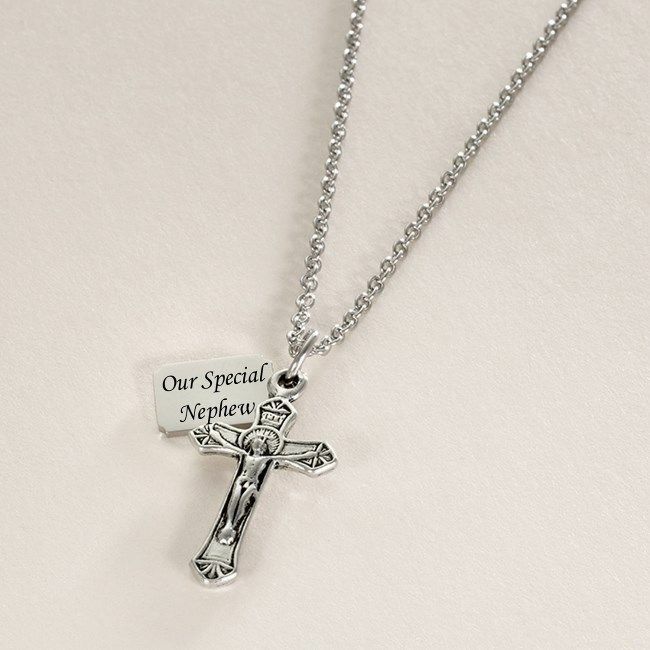 Crucifix Necklace with Personalised Engraving on Tag Charm. Free engraving is included on one or both sides of the steel tag as shown. This unique piece of religious jewellery is ideal for adding words and messages such as names, special dates and special occasions. A maximum of 20 Characters per side (including spaces) can be engraved on the tag. Part of our range of personalised necklaces for men, women, boys and girls. Metal Parts: Chain and Tag both made with tarnish proof stainless steel. The necklace is high quality pewter. Ball Chain Length: 24 inches. Presented in a padded and hinged gift box with the gift card shown for you to add your own personal finishing touches. We can engrave in a wide range of fonts for you. Please just send contact us if you don't see the font you require.